2009 Mission One. Picture credits - Mission. Submit more pictures. Mission motorcycles� electric induction motor provides over 100 foot-pounds of torque. Unlike an engine, however, the torque curve on our electric is completely flat. The rider feels 100 foot-pounds of torque at a standstill, at 60 mph, and everywhere in between. Price as new (MSRP): US$ 68995. Prices depend on country, taxes, accessories, etc. Comments: Liquid-cooled, 3-phase AC Induction engine. High Energy Lithium-Ion w/ Integrated Thermal Management System. 150 miles/240 km per charge. 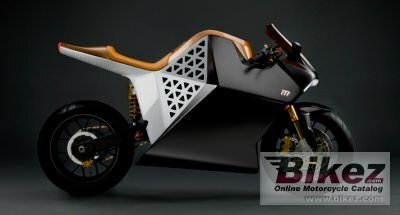 Under 2 hours charging time with 240 V.
Modifications compared to previous model: Limited edition of 50 bikes to be sold in 2010. Ask questions Join the 09 Mission One discussion group or the general Mission discussion group. Bikez has discussion forums for every moped. View comments, questions and answers at the 2009 Mission One discussion group. You can sign up for e-mail notifications when other riders answer you. If you have extensive experience with the MC, please send us a review. If you consider buying this bike, you should view the list of related motorbikes Look at photos. Compare technical specs. And check out the rating of the moped's engine performance, reliability, repair costs, etc. You can compare the rating with other bikes.